The Animal Endocrine Clinic is a state-of-the-art veterinary clinic headed by Dr. Mark E. Peterson. 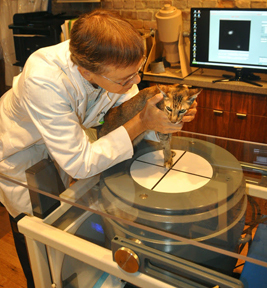 Dr. Peterson is a veterinarian who, over the last 35 years, has become renowned for advancing the world’s understanding of feline and canine endocrine (hormonal) disorders such as Addison’s disease, Cushing’s syndrome, hyperthyroidism, hypothyroidism, and diabetes. Dr. Peterson is currently limiting his practice to the treatment of thyroid disease in cats and dogs, with a primary focus on the proper treatment of feline hyperthyroidism. By specializing in the diagnosis and treatment of dogs and cats suffering from thyroid disease, the clinic’s highly qualified staff provides the most advanced, comprehensive medical care available. In addition to offering the highest caliber of medical services available in the field, we also work very hard at making your time with us pleasant for both you and your pet. We do as much as we can to maximize your pet’s comfort level. Click here to watch a video about the AEC. We built our clinic to look like a warm, inviting home, rather than a sterile medical facility, so that pets feel at ease — and it works! Pet owners tell us that they’re amazed by how much more calm and cooperative their pets are here than at other clinics. For cats that need to board here, we have a live video camera within each of our spacious cat condos so that you can check on your cat from the comfort of your own home. To get a feel for the Hypurrcat Spa Experience from your cat’s perspective, click here. Our mission is to help pets with hormonal disorders live longer, healthier, and happier lives. Please feel free to contact us with any questions.